further adventures without the bread maker. Since my fab bread masterclass with Warings I’ve been honing my kneading skills and playing around with different recipes. 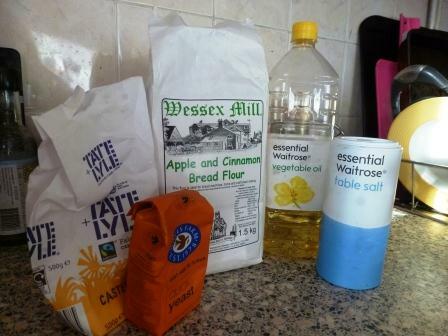 Recently I picked up some lovely local-ish apple and cinnamon bread mix from the Wessex Mill, down the road in Wantage. I’ve never used a bread mix before and the instructions on the packet were designed for the bread maker but said it could be made by hand without altering any of the amounts so off I went. Following the instructions on the packet I mixed the ingredients together with 320ml of warm water and kneaded for about 8-10 minutes. 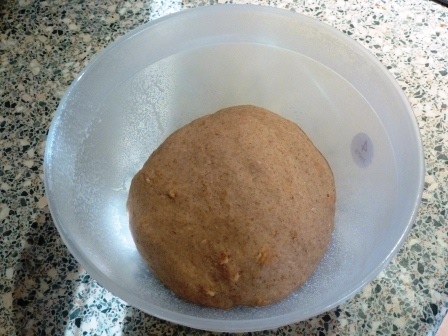 At first I was a little worried that the dough would be too wet, the packet says that if the loaf collapses in the bread maker and to use less water if this is the case, so I was concerned; but the dough came together nicely as you can see. 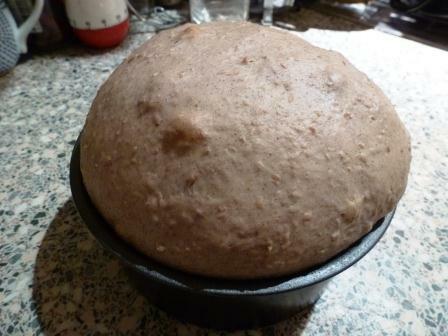 I left it to prove until it had doubled in size, knocked it back and the left it to rise again in a greased round tin. As the packed didn’t have any baking instructions (assuming you know or are using a bread maker) so I used my Waring’s instruction sheets and gave it about 25 minutes at 200° ( or until it sounds hollow when tapped which I will admit is a concept I still don’t fully understand). I was pretty pleased with the results. 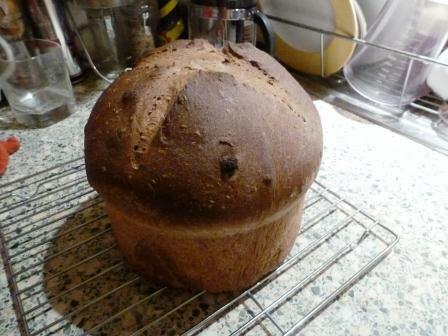 I even managed to slash the top properly, the structure of the loaf was pretty good too, by my standards anyway. 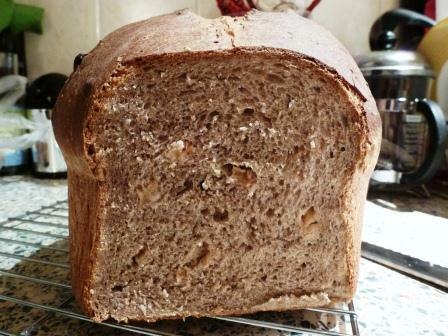 It rose very well and wasn’t overly cinnamoney (sic) or sweet, I did add sugar which was optional in the recipe and whilst I’m not sure it would work with savory foods it was a lovely breakfast loaf with butter, honey or jam. I must confess I’m still enjoying making bread by hand when I have the chance, it’s a little bit magical which is a good job as I’ve got to loaves worth of this flour left in the cupboard! Having a mid November birthday I try to hold off doing anything Chirstmassy before it, and increasingly difficult task with Christmas sneaking in earlier and earlier, but I try. Once my birthday, and that of a very good friend even later in November are over I let myself start thinking about Christmas; I build up slowly otherwise I think I could get a bit carried away. The first step is making a Christmas cake, a bit of a faff yes but always in my experience nicer than a bought one and while people are want to joke about turkeys lasting far to long, but a large Christmas cake soaked in enough booze will keep well into the New Year, whether you still feel like eating it then is another matter! 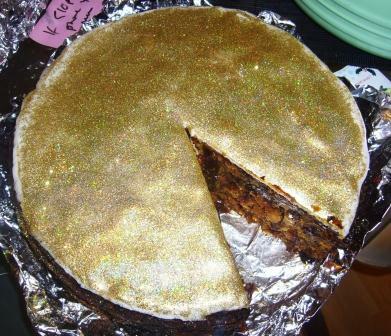 But here is the best recipe I have found and one which has drawn the most complements for Jamaican Black Cake; a rich, fruity, boozy cake which everyone seemed to enjoy. I don’t know if this is authentic, a search of the internet shows up a variety of methods, some involving soaking fruit for a month or longer, but this recipe suits me. 24 hours before baking finely chop the fruit, zest the lemon and lime and place in a large bowl with 1 cup of the rum and vanilla essence and leave to infuse. Beat the eggs and last cup of rum together then add to the creamed butter mixture in two halves, adding a spoon or two of the flour mixture if it looks like curdling. Fold in the remaining dry ingredients and pour into the tin. Level the top of the cake and bake in the centre of the oven for approx 1 ½ hrs, or until a skewer comes out clean. Allow to cool in the tin and store in an air tight tin, you can feed the cake with an additional shot of rum every week until it is needed. Make no mistake this is a very rich cake, and ideally it should be made a month in advance so it can be topped up with rum and to allow the flavours to develop. However, I think you could make it quite a bit closer to the big day and still get away with it. 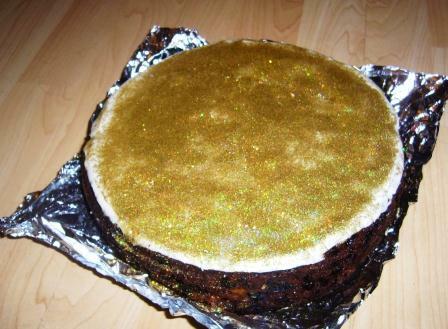 It also ices very well, although I did over do it with the edible glitter! For the past few years I’ve make my own Christmas Cake…but this post isn’t about that, it focuses on an annual problem; what to do with the left over ingredients from making the Christmas Cake. Which ever recipe I use there are always a few things left over. Glace cherries tend not to hang around for very long as both The Man and I will happily eat them from the packet, raisins etc are also eaten swiftly. Candied peel usually lurks in the cupboard until some time in the summer, and this year there is treacle too. Trying to cut down on food waste I don’t want to throw these things out if I can help it so I am on a quest to use them up. First up, treacle flapjacks. I used to hate treacle with a passion, Mum would make treacle toffee every bonfire night and watch as her ungrateful daughter spat it out or turned my nose up at it. I have since made my peace with treacle, good job as there is the rest of a large tin in the kitchen; and this recipe is quick, easy and delicious. Preheat the oven to 180 C / Gas mark 5. 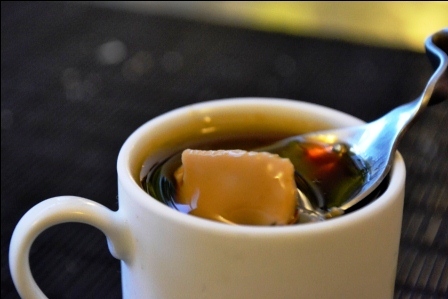 Melt the butter, sugar and syrup or treacle in a saucepan, but be careful not to let it boil. Stir in the porridge oats and the salt and mix thoroughly. Press the mixture into a 20cm (8 in) round baking tin and bake for 25 minutes, don’t be tempted to leave them in the oven for longer or they will set solid and be really difficult to get out of the tin! Remove from the oven and mark into slices. Lift from the tin and leave to cool before cutting. Store in an airtight container. TA DA! 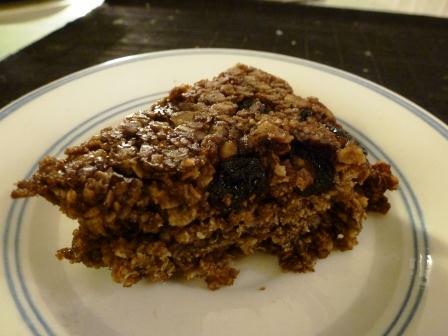 Not the best picture in the world, but they are much darker than standard flapjacks too. You could replace the treacle with golden syrup, but these had a very comforting old-fashioned taste too them. They aren’t very healthy either, with all that butter and sugar; but as a treat or an energy boost I don’t think you can beat a good flapjack. Luckily there is plenty of treacle left so I think we will get through plenty of these. I’ve had a bit more time to do some cooking recently and as the nights draw in and it gets colder I like start craving warming, comforting dishes and a favorite cut of meat to use are ox cheeks. 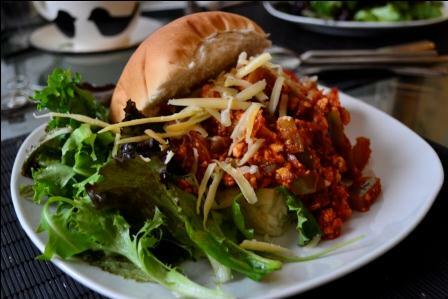 Not only are they cheap, a little goes a long way and they can be bulked up with other cheap ingredients to make something quite wonderful like this. ½ cinnamon stick, 4 cloves, 4 allspice berries and 2 bay leaves, preferable tied in muslin bag so you can pull the out at the end. Lightly dust the meat with flour. In a large lidded pan, heat the oil and brown the ox cheek on both sides then set aside on a plate. Turn the heat down a little and fry the onions for 5 minutes, add the garlic and fry for a couple of minutes being careful not to let it burn. Next deglaze the pan with the wine and orange juice, add the chilli, tomato puree and stock, stir until combined then add the spices in their bag before returning the ox cheek to the pan. Place the lid on the pan and cook on a very low heat for at least 3 hours, longer won’t hurt. After at least three hours the meat should be soft and tender, remove from the pan and on a plate or chopping board, use two forks to shred the meat and then return it to the pan with the sauce which should now be thickened. Remove the bag of spices taste and season as you wish. 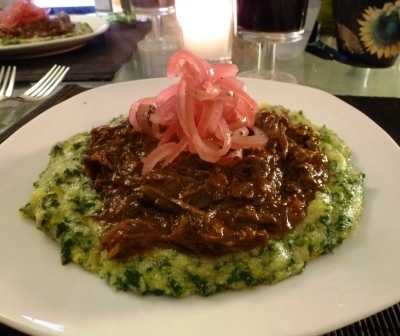 I served this with quick cook polenta with kale stirred through to give it a green colour and Thomasina Mier’s pink pickled onions, which marinated in lime juice give a nice crunch and tang to the meal as well as looking beautiful with the other colours. This summer I spent a week with my family in Cardigan, West Wales I grew up in Wales but pretty close to the border and with English parents so I had a sort of Welsh “lite” upbringing, which means I don’t speak Welsh but can read the road signs, I can sing a passable version of the national anthem if pressed and I had to dress up in National Dress for St Davids Day. That traumatic annual experience might have been enough to put some people off but since I’ve been away I’ve grown to appreciate Wales much more that I did when I was there. Cardigan really feels like being in Wales (sorry Chepstow) and after a week of walking past bakeries selling Bara Brith and fresh Welsh Cakes I couldn’t wait to cook them again especially as I had nabbed a cast iron pan from my Mum, the closest thing to a traditional bakestone I could get without spending money. For my first attempt in 15 years and without parental supervision I don’t think they turned out too badly, although I could have rolled them more thinly. The recipe I used is from Elizabeth Luards wonderful book A Cooks Year in a Welsh Farmhouse, they aren’t as sweet as some and don’t include mixed spice as some recipes do. They were wonderful but I did miss the slight spicyness so would add a little next time. 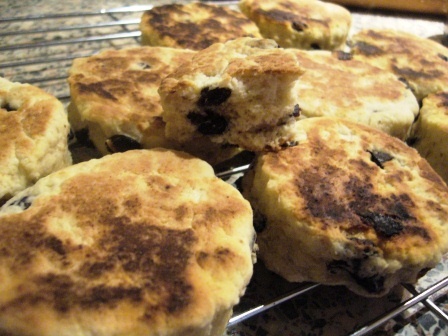 Luard also doesn’t dredge her Welsh cakes with caster sugar, something we always did and I prefer. However, these cakes did go very well with cheese (a successful experiment by The Man) as well as being eaten plain or with butter (as Luard suggests) so they were a bit more versatile than very sweet / spiced ones. Put the flour in a bowl and rub in the butter with your fingertips as if making a pastry. Mix in the fruit and sugar. Whisk the eggs with their own volume of water (measure with an eggshell) and work the liquid into the flour mixture till you have a soft rollable dough – I needed a little more water than this. Gently and thoroughly heat a griddle or a heavy frying pan. To test whether it’s hot enough, sprinkle the surface with a pinch of flour – if it toasts golden within 4-5 seconds without burning, the heat is correct; if it smokes and blackens immediately the metal is too hot. Wipe with a buttery cloth then slip the cakes onto the hot metal. Wait till the underside is browned and the surface begins to look dry, then turn them gently and brown on the other side. Allow 6-8 minutes in all. Best eaten fresh and warm, but they re heat quite well in a toaster. I’m a fan of Soda Bread, some people aren’t. A bakery in Windsor once refused to sell me a loaf on the grounds that the assistant “didn’t understand why so many people liked it”. 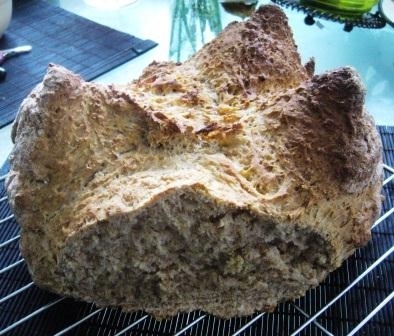 I think fresh soda bread is a thing of beauty and it is one of the first things I cooked with my Mum who developed a taste for it living in Norther Ireland. 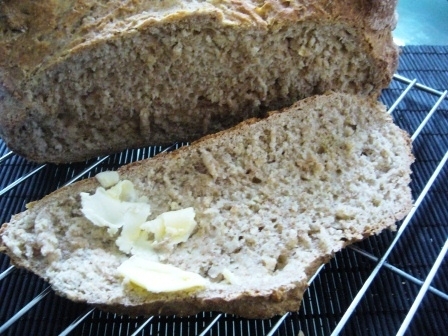 Soda bread also has the advantage of being blinkin’ easy to make and quick to bake. This recipe uses half spelt flour which I picked up at Y Felin in St Dogmaels while I was away, and half white flour. It’s lovely stoneground organic flour and I got a tour of the mill with the miller himself so I hope it does the flour justice. 400ml buttermilk or 400ml milk with juice of half a lemon added. Pre heat oven to 230°. Sift the dry ingredients together in a bowl. Add the egg to the butter milk and whisk until combined. Make a well in the centre of the flour and add the buttermilk mixture, quickly combining into a rough dough, don’t hang around with this bit speed is of the essence. Shape the dough into a rough ball and place on a baking sheet. Cut a cross in the top to help it rise and quickly place in the oven. Bake for 20 minutes at 230°. Then turn the oven down to 200° and bake for a further 20 minutes or until the loaf sounds hollow when the base is tapped. The end result should be a well risen loaf with a firm crust that is still soft inside. Soda bread is best eaten fresh, preferably with a little salted butter but, wrapped in a tea towel and kept cool this loaf kept well for a couple of days. Think you can’t make bread? Go on try this. Making our own pizza dough is a bit of an indulgence, and I don’t think it will replace shop bought pizzas totally in our lives but some times I like to take a bit longer over things. In truth most of the time this recipe takes is letting the dough rise, and you can do something else while the yeast is doing its thing. I have made pizza dough using the bread maker, and while this recipe means getting your hands and work top dirty is actually quicker. It also means I don’t hit the wrong button and end up cooking my dough on the boiling hot jam cycle, this does not end well! This is a great recipe and I’d urge you to give it a go, actually it is a combination of Lorraine Pascale’s pizza topping and pizza dough from Katie Caldesi made using half strong bread flour, half 00 pasta flour. I halved the recipe using 125g bread flour, 125g 00 flour, 160 ml luke warm water, 2.5 g (ish) fast action dried yeast and 1 tsp yeast, and just made 1 large pizza for The Man and I. After kneading the ingredients for 10 minutes I finally got something approaching the soft, smooth, stretchy dough you see on TV. This is a first for me. I left it to rise for about an hour, till it was double its original size and then swapped over to Lorraine Pascale’s recipe; heating the oven and topping the pizza rather than letting it rise for a second time. 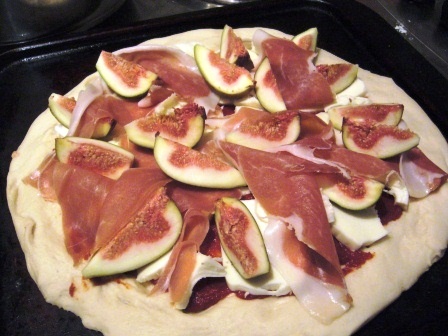 I used less tomato puree than Lorraine suggests, 3 tbsp rather than a tube, a ball on mozzarella, 6 slices of san daniele ham and 3 figs, I may have not rolled the dough out enough but the amount I used seemed appropriate to the size of the pizza I ended up with. 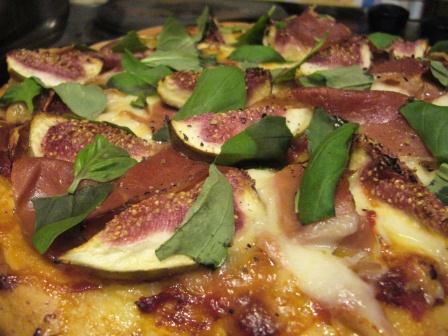 This is what it looked like after 30 min in a 230°C oven and scattered with torn basil. I used to be very sceptical about the combination of meat and fruit, but I’m getting used to the idea now and this is a combination that proves that the union can be a great one. 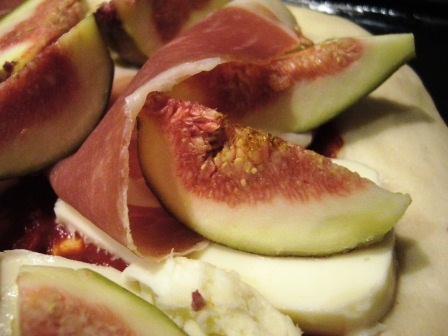 The figs smelled almost christmassy, and had stayed juicy and sweet. Thanks to the hot oven the ham had crisped and it’s saltyness intensified with the creamy mozzarella balancing the two flavours and tying them together. The base was light a crispy, but would have been better if I could master sliding the topped pizza from a chopping board on onto an over hot tray. I can’t do it, and I worry too much about dropping the whole thing on the floor; but I think we ended up with something pretty authentic, and very very tasty. This is another recipe from my book of the moment by Katie Caldesi and inspired by the gorgeous meal The Man and I had there recently. I had a trio of panna cotta for dessert; basil, strawberry and coffee with espresso syrup. I’m going to have a go at the basil recipe ( it’s also in the book) at some point but for me it was the coffee one which stole the show. As The Man will confirm I watch Come Dine With Me a fair bit, and I’m often puzzled by people worrying that their panna cotta won’t set, it seems to me that as long as you don’t over heat the gelatine and use the right amount of liquid to gelatine ( follow the recipe) they are very simple and quick to make. But maybe it’s easier without the camera crew and group of strangers in your house! Healthy they are not, these are a calorie laden combination of double cream, sugar, stong coffee and enough gelatine to give a set but soft texture. Nigella once used the phrase ” a hint of inner thigh wibble” to describe the texture of a cheese cake, it makes me cringe but that’s what I am aiming for with a good panna cotta. It is also a warning about what you will end up with if you eat too many of them! 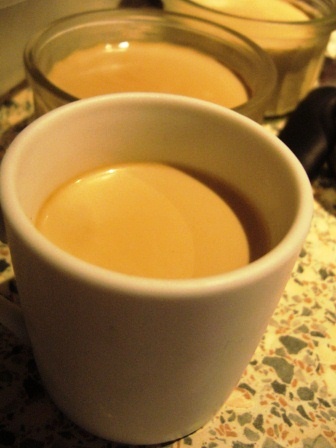 The coffee and cream mixture is smooth, creamy and not too sweet with a subtle coffee flavor, the coffee syrup is the opposite; and quite addictive. In a thin, sticky, intensely sweet coffee-ee layer I think it lifts this into my pudding hall of fame. Again it is incredibly easy. I got distracted and forgot the recipe, just throwing 200g of sugar into a pan with 100ml of sugar into a pan and boiling until it had reduced to a caramel and it was fine. I made the panna cotta in espresso cups, partly as portion and calorie control but also because I think the flavours here work best in moderation. 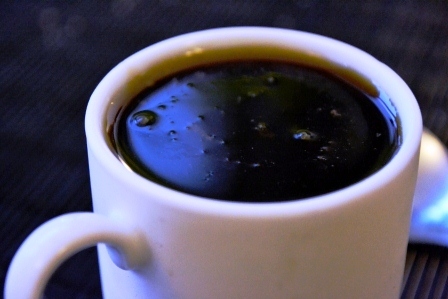 I loved to coffee syrup so much that I’m planning on making a double or triple quantity batch to keep in the fridge to use on ice cream, as a base for ice coffee, cocktails or to add to a glass of cola *whispers* or maybe just to eat with a spoon as a pick me up. When I was growing up we hardly ever had takeaways; in rural areas takeaway meals aren’t the convenience food they are sometimes seen as. Our nearest take away anything was a half hour round trip, so we tended not to bother. With the exception of my first year at university, when I really went to town, I still don’t indulge too often. I can’t begin to explain my youthful excitement when I realised that not only was I surrounded by different options but I could RING THEM AND THEY WOULD DELIVER MY FOOD TO MY DOOR!!!!! A couple of stone and a good chunk of my student loan later I realised something had to change! However; I still believe that sometimes, when you can’t be bothered to cook ( yep it does happen); a good takeaway ( or a deliciously bad one) is a thing of beauty. 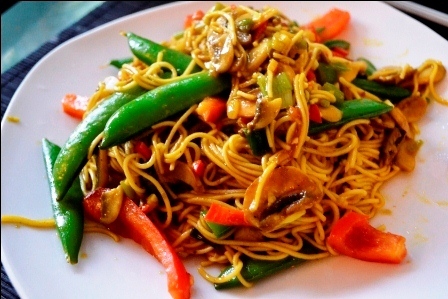 One of my favourite dishes is Singapore Noodles. The Man and I have a Chinese takeaway about once a month but because the place we go to does amazing salt and chilli chips I don’t order it in case I slip into a carbohydrate coma. I use this Nigella recipe minus the chicken stock (too wet) and the dried shrimp (a bugger to find round here) and use an assortment of whatever vegetables we have in. It’s very easy, quick and tasty. Even living in the centre of town it’s almost as quicker to make than walking to the Chinese. 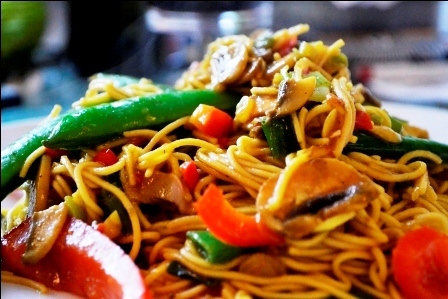 To save time I put the noodles in a bowl of boiling water and leave them there while I’m cooking the rest and they are cooked by the time the rest is done. Voila!